The costliest mistake 2% investors make is timing the market. They sell after losses and buy back only when the coast is clear. The problem is not just the money you leave on the table this time, but these mistakes leave behind scar tissue that compounds in our brains. It doesn’t take long before we’re unable to think objectively. Rather than viewing a buy/sell decision as independent from all others, we think about the outcome of previous mistakes and the regret we felt after buying or selling. What’s nice about the stock market, aside from the fact that it’s currently at all-time highs, is that it always provides clear reminders as to why timing it is so difficult. Stocks got off to their worst start ever this year and it was pretty easy to come up with a long list of reasons to take some risk off the table. But people who sold are regretting that decision nine months later. 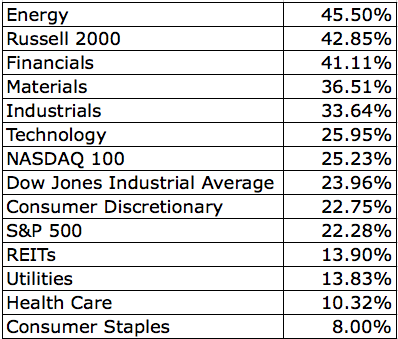 The table below shows how far different U.S. sectors and indexes have come from their 2016 lows made either in January or February. If you’ve decided that you’re not interested in timing the market and you’re going to go the buy/hold route, you must be able to see the stocks you own fall 40% or more. But talking about declines in percentages hides where the real pain lies. Here is a good way to think about this: Picture your losses in dollar terms. For example, say you hold a 60/40 portfolio and the current value is $1 million. If the stock part falls 40%, that’s a decline of $240,000. If you know that seeing this much money evaporate is too much for you to stomach, own less stocks! You can’t put a price on being able to sleep at night the next time a recession hits and everyone around you is losing their mind. Last week I showed that all-time highs are not bearish. However, it’s also true that the worst bear markets ever- 1929, 1973, 2000 and 2008 all came after all-time highs, when investors were feeling supremely confident. So now is a really good time to make sure you’re not taking more risk than you can handle. The possibility of stocks getting cut in half is real and never goes away. It’s important to keep in mind that investing isn’t just about maximizing returns, it’s about maximizing the returns that you can reasonably be expected to achieve, given how you deal with market declines and volatility (to the downside, and upside). Preventing scar tissue from building up in your brain is one of the keys to being a successful long-term investor and decreasing the number of decisions you have to make is the best way to do this.